Like I mentioned in an earlier post, Zoe got a piggy bank from our trip to Tahoe. When we got home it was the toddler witching hour (read: 5pm) and I needed an activity to entertain her until dinner. Lucky for me, we keep a giant jar of pennies. Piggy all of a sudden got an appetite. I showed Zoe how to drop the coins in her piggy bank. I'd remind her to turn the penny the other way. Then I'd hear, " Yeah I did it!" and then she'd kiss the pig. I love her little phrases and songs as the background to my days. 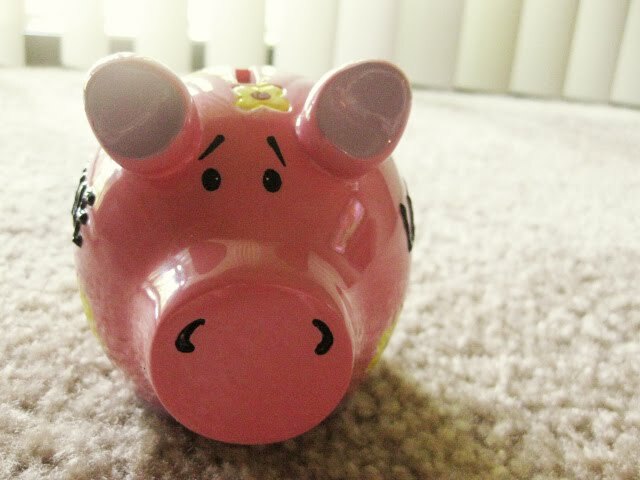 This piggy bank is the cutest my mom got Lilly one when she went to Vegas. I love reading Zoe quotes and imagining her saying them...she's so cute!